The Channel is a guest house in Weymouth Dorset situated in a beautiful grade II listed Georgian town house just over the road from Weymouth beach. Originally built in 1797 and located on Weymouth's famous Esplanade, our bed and breakfast looks out over Weymouth Bay one of the finest stretches of coastline in Dorset at the centre of The Jurassic Coast a World Heritage Site. two profiles were found for Channelhotel.co.uk in social networks. Among other social networks the website is represented in Facebook and Twitter. The web server used by Channelhotel.co.uk is run by Fast Hosts LTD and is located in Gloucester, Great Britain. There are many websites run by this web server. The operator uses this server for many hosting clients. In total there are at least 142 websites on this server. The language of these websites is mostly english. 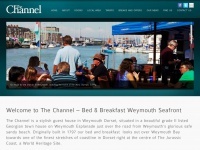 A Nginx server hosts the websites of Channelhotel.co.uk. For managing the data of the webpages the CMS WordPress in the version 4.2.2 is used. The website uses the latest markup standard HTML 5. To analyze the visitors, the websites uses the analysis software Google Analytics. The website does not specify details about the inclusion of its content in search engines. For this reason the content will be included by search engines.